Trader Vic's is a Polynesian restaurant and bar which specializes in island cuisine and tropical drinks in an exotic atmosphere. Island cuisine is a mixture of French, Creole and Chinese flavors and influences, and is mostly found on tropical islands. Latin American rhythms set the mood and atmosphere with lively songs for an upbeat evening that can extend long into the night! Cancan your way to a New Year’s Eve countdown at Trader Vic’s. Zombies and Vampire drinks for AED 40. 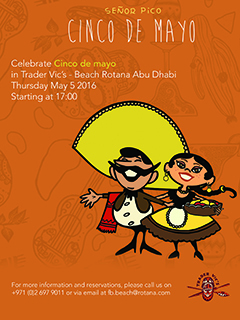 Join Trader Vic's for their 'Miami Nights' every Sunday. Trader Vic’s is turning 24 years this 24th of April 2018.